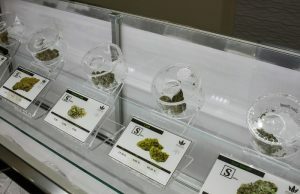 The Las Vegas Strip is usually known for adding casinos to its iconic stretch, but this March it became the new home of Essence, the first and only cannabis dispensary with a location on Las Vegas Boulevard. This is a huge deal for patients in the city, and for anyone traveling to the desert who doesn’t want to risk taking their medication with them. Needless to say, the store opening was a moment co-owner and CEO Armen Yemenidjian has been anxiously awaiting. Essence could have opened it’s doors several months ago, but the team decided to wait until they had the information needed to do it right. That information came in droves when Yemenidjian held focus groups in which participants told him everything they liked and didn’t like about the experiences they’ve had when purchasing their medicine. 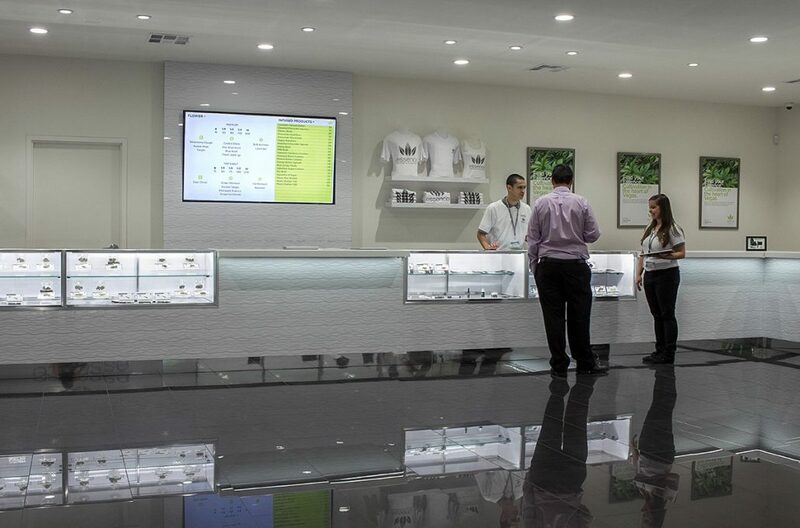 Using the feedback to shape the dispensary’s business model, the end result has been described as Apple store meets jewelry store, with the obvious focus on medical cannabis in all of its forms. Located between a Walgreens and one of Las Vegas’s most well-known wedding chapels, Essence has carved out a truly beautiful space to begin its mission of serving patients. The moment you walk through the door, a calming feeling of knowing you’re in the right place for medicine washes over you. The rooms feel clean, inviting, and professional thanks to the bright white walls, marble floors, and modern furniture. Most doctors’ offices and pharmacies lack the style and comfort that can be found here. Through a clear glass window, you are promptly and politely greeted by the staff who have you sign in with an iPad and let you know that a patient consultant will be with you shortly. A patient consultant is different than a budtender, as everyone who works for Essence must undergo a rigorous three-week training course to become a patient consultant. It was described to me as attending “marijuana school.” There isn’t a ceremony when the training is complete, but with the amount of knowledge that each new patient consultant has about cannabis as medicine, you would think they held a degree in the field. And if patients have concerns regarding their health conditions or other medications, they can always consult first with the on-site registered nurse, who is on stand-by daily. Having a founding member of the American Cannabis Nurses Association on hand is just another feature that Essence has to offer to Las Vegas. This is a perfect example of how Essence actualizes their core beliefs. “It’s not about us, it’s about the patient,” Yemenidjian says. That sentiment comes to life when you experience just how friendly, caring, and knowledgeable all the patient consultants really are. Essence boasts an impressive line of products. The flower has three levels, including premium strains, top shelf strains, and a third tier that is high quality at a lower price ($35 per eighth). No eighth is over $50, even for the premium flower. That’s one of the lowest price points in all of Las Vegas currently. They also have many select varieties of kief and pre-rolls for $10 a piece. Moving down the row of display cases, customers will come across concentrates, waxes, and liquids of all shapes and sizes. For dabbers and vapers, there are several different strains of Moxie shatters, O.penVAPE oil cartridges, and Holy Grail CBD e-liquids, as well as other flavored vape oils and disposable CO2 cannabis oil cartridges. If tinctures are more your preference, then you can go for the vanilla, peppermint, or unflavored sprays from Holy Grail, or go the drip route with Mary’s Nutritionals Elite CBD Remedy Oil, which comes in a 500-mg bottle. Of course, there are also the edibles. From Evergreen Organix’s Coconut Chocolate Macaroon Bites and Double Chocolate Chunk Brownie Bites, to cannabis-infused Honey Bears, Peanut Butter, Chewy Bears, and Happy Ranchers from NevadaPURE, there is no shortage of delicious medicated treats. One of the most interesting lines of medical cannabis products that Essence has to offer has to be the variety of different topicals from Mary’s Nutritionals. Muscle Freeze uses the combination of CBD and natural plant extracts to create an infused version of the popular cold-and-hot pack customers are used to. The beauty of topicals is that they can be used anytime without worrying about it having a psychological effect. They also carry CBD pens, patches, and lotions. For customers who just want to pop a pill to feel the benefits of CBD, they could try capsules from either Holy Grail or Mary’s Nutritional. Pretty soon they’ll add even more products, a majority of which will come from their very own cultivation facility just a few miles away. I was lucky enough to take a tour of the facility, and to call it state-of-the-art would be underselling it’s beautifully complex science. At over 54,000 square feet, the space looks like what you would imagine a cultivation facility put together by Google would be like. Except it’s even better. 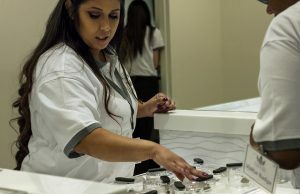 Until it’s up and running, customers can still stop by Essence Las Vegas right on The Strip near the Stratosphere tower to get the high quality, affordable medicine they need.